Students of Japanese martial arts are used to hearing about the hara, the “center” of energy (ki) located from behind the navel. Properly using the hara, we are told, is “ki” (pun intended) to moving efficiently, generating power, and preventing injury. Many beginning students dismiss the entire idea of hara and ki as quasi-mystical nonsense—at least until they see for themselves that these concepts work in real life. Additional proof of this concept can be seen by cross-cultural comparison. The human body is a universal that doesn’t change with time or place. Thus, we should not be surprised that Western arts have developed much the same idea. 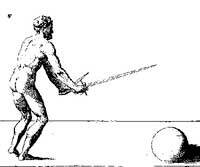 For instance the Italian fencing theorist Camillo Agrippa, in his 1553 “Treatise on the Science of Arms,” expressed a very similar notion of the vita as the body’s physical, spiritual, and energetic center. What’s more, Agrippa linked this idea to his own culture’s ideas of metaphysics. The fact that similar ideas appeared in disparate times and places not only points to the truth of the concept of the hara/vita, but confirms that those who think that Western fighting arts are devoid of spirituality are fooling themselves. In modern Italian, vita means “waist.” It also quite tellingly means “life.” However, language does not remain stable over time. How would Agrippa’s contemporaries have understood him? One clue comes from Renaissance dance manuals. In this period, dancing was not just something done for amusement, but an intricate social ritual. Knowing how to dance, like knowing how to use a sword, was one thing that set a gentleman apart from a commoner. Fabritio Caroso, in his dance manuals from 1581 and 1600, uses “vita” in both in the sense that we mean “life”—both in terms of “civil life” and the biological state of being alive—but also as the place from where you should move. For Coroso, the vita something that can be ornamented by dancing gracefully, or a part of the body that we have to move in certain ways in order to properly perform certain actions in the dance. Caroso’s contemporary Negri, in his 1604 book on dancing, likewise says that to move gracefully, one has to carry the vita properly, and also that clumsy people let their vita fall over one foot and then the other when they walk, but that elegant people (which is to say gentlemen, which is to say trained dancers and martial artists) ought to move from their vita with moderate, balanced steps. 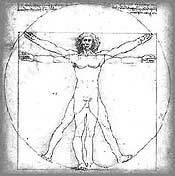 Leonardo da Vinci’s 1492 illustration of the "Vitruvian Man." We can thus see the multifarious meanings one word might have—the vita is at once the source of bodily energy, our physical “center”—both in terms of center of mass and middle of a man’s measure—and life itself. We can see this Renaissance idea in Leonardo da Vinci’s famous Vitruvian man, whose navel (that is to say, his vita) is both the center point of the figure and of the circle representing the cosmos. This figure is so-named because it represents the theories of the Roman architect Virtuvius on how to construct a temple. In fact, the Vitruvian plan was actually the original design for St. Peter’s Basilica in Rome. . . .move your left foot up against the right and make an attack to the right side of enemy’s body by pushing his sword aside with yours. If he parries, disengage quickly, stepping with your right foot towards his left side, and, voiding your vita, move your left foot to hit him. . .
Agrippa is in other words instructing us to step away from the oncoming thrust and twist our center of mass away from the enemy’s counterattack—not too dissimilar from the idea of tai-subaki in karate. . . .If you were to place the ball on the ground and try to strike it however you can, on whatever side you might wish to, you can well imagine that you will not be able to strike it firmly, no matter whether you hit it in the center or on the edge. This is because it defends itself with its motion. In fact, if you study how it moves, you will see that it is a naturally mobile instrument. It therefore seems to me that this is a model of our bodies, which are not like balls insomuch concerning what they are made of, but rather in how they move. You can understand everything you need to know to use the techniques I have discussed if you remember that our bodies are the same as the ball and move with the same skill and agility. . . . While this can be seen as a simple example to express how one should move in offense and defense, Agrippa’s ball would have reminded the educated reader of the same Vitruvian classical circular conception of the human body. In other words, human beings being (metaphorically) spherical are naturally perfect, and capable of the most perfect form of motion, rotation about a center. What’s more, as Agrippa makes clear in the dialogue on astronomy at the end of the book, we are microcosms of the cosmos. It thus ought not to surprise anyone that we able to move in the same way that the heavenly spheres do. (Agrippa published in 1553, ten years after Copernicus but before everyone was convinced that the Earth goes around the sun.) This, in turn, relates back to that same Vitruvian temple: The church in which we pray to God, the Creator of the Universe, is a mirror of the cosmos built to the proportions of man, who is created, in turn, in God’s image. As with other contemporary thinkers, Agrippa believes the human beings, having been created in God’s image, to be naturally perfect. What he is telling us, then, is that because of the nature of our own bodies and our inherent worth as human beings, we ought to be able to perform any action necessary for self-defense. Students of all martial arts would do well to remind themselves of this. The vita is not only the key to efficient movement, but also a moral and spiritual truth. Ken Mondschein is a Ph.D student in history at Fordham University and classically trained fencer currently enjoying his Fulbright grant in Paris. A student of classical fencing and historical swordsmanship under Maestro Ramon Martinez, he is also knowledgeable about European classical dressage, the art of horsemanship, and its history and application in mounted combat. In karate he holds a black belt from Seido Karate in NYC. Ken is Associate Editor for European Sword Arts for FightingArts.com and is a frequent contributor to the web site.